I never expected that I would get my first DSLR by the time I was 16. I also never expected that it could be so complicated and stressful to find out what kit I needed for my camera. One of the most important pieces of kit that you will need when buying your first or your 100th DSLR ( I wish I was you if I could buy 100 DSLR's) is the lenses. Do you just buy the lens that comes with the camera? Do you buy another lens alongside it? Why are they all so expensive? I DON'T GET IT! That was me around four and half months ago. 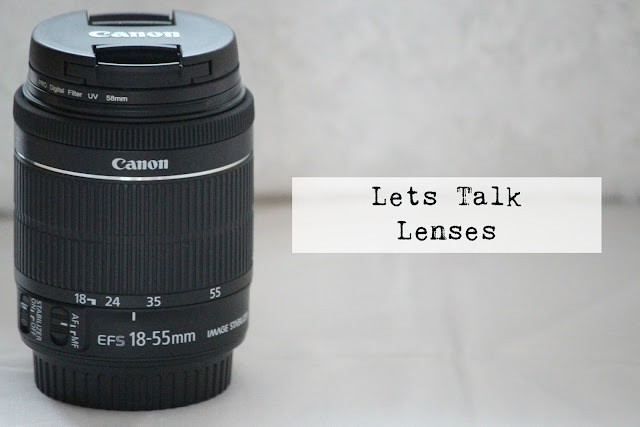 I knew nothing about lenses, and although I don't now consider myself an expert, I have learnt a lot about lenses and I want to share that knowledge with you today. Okay, this is going to get quite techy and some bits may get boring, so please don't fall asleep. I am going to split this up into sections and make it as easy as possible for you, take it as a ' Lenses for Dummies' lesson. Not that you are dummies or anything! All lenses are known by their size which is measured in millimeters ( 18mm, 50mm,250mm etc.) This is called the focal length. This is the measurement between the sensor and the center of the lens when it is fully focused, which is called being focused on infinity. With a short focal length ( eg, 18mm) you would need to stand pretty close to your subject for it to fill the frame of the photograph or stand back if you were doing a wide angle shot. A long focal length ( eg. 250mm) allows you to stand far away and still get your subject to fill the frame. Perfect for spotting celebrities eh? WHAT ARE THE DIFFERENT LENSES? A kit lens is a basic lens which comes with most camera deals, especially if you buy your DSLR from a shop like Argos etc. This is different from a standard lens, by the way, which I will get on to in a jiffy. With the DSLR that I bought, it came with a 18-55mm kit lens, which has auto-focus and manual focus plus image stabilization ( Don't worry I will get on to these in a minute too!) This is the lens that I use to do 90% of my photography as it covers close up and wide angle. If you do no want to buy a lens with your DSLR, you need to look for the body alone. A wide angle lens does what it says on the tin. It takes pictures using a wide angle so that you can get all the subject in the frame. Surprise surprise but this is perfect for landscapes. Wide angle is anything less than 24mm. A standard lens covers everything from 35mm to 85mm. You would use a standard lens for most things. 85mm is especially good for portrait photography, so that may be one to think of investing in if you are a fashion, blogger. Although lots of cameras come with Macro settings ( and not just DSLR'S) They allow you to get really close to your subject and make it look life size or even bigger. This works really good for small insects or flowers. Fish eyes are a bit of fun! They make the photo look distorted at the edges but do cover 180 degrees. I wouldn't say this is an essential lens, but it's fun to play around with a cheap one on your phone! Some lens will just have one focal length eg. a 50mm lens, these are called prime lenses and some lenses will cover a range of focal lengths (18mm-55mm), these are called zoom lenses. There is a range of advantages and disadvantages for both, so let's dive in. Zoom lenses come with a range of focal lengths, some very small and some big. You change the focal length of a zoom lenses by twisting the end of the barrel. These are very convenient because it means that you don't have to worry about changing the lens. If you have a big range zoom lens, it means you can do wide angle or close up. Prime lenses have one focal length eg. 50mm which is the most commonly known one because it is closest to the human eye vision and creates the famous 'bokeh' effect, which everyone including myself loves. They are not as convenient because you may have to go closer to your subject to get a better shot, however, this may not always be possible. WHAT ELSE SHOULD I KNOW ABOUT LENSES? Just like everything else in the world, some brands are better than others. As well as making sure you pick a lens that meets your requirements and is within budget, you need to consider the brand of the lens you are about to buy. Tamron and Sigma are known to be the best brand of lens, that don't make cameras. Though I have had an issue with my Sigma lens, so I am not singing praises for them at the moment. My two lenses that I own are both Cannon, which I have had no problems with. When buying lenses one thing that can make a lens more expensive than its counterpart is if it has image stabilization. Image stabilization is a switch on the side of your lens ( that should always be on if you have it) that stops the image from being blurry even if you move a little. On small focal lengths, image stabilization may not be a necessary but over 250mm definitely so! On the side of the barrel, there may be a switch to decide whether you want it to be on manual or automatic. I always keep my manual off because I like to adjust the aperture, white balance and the ISO etc. on the dial at the top of my camera. But some people will disagree, it is completely up to you, though. Well, that's it! For my very comprehensive guide to lenses! I hope you guys found this useful and I hopeful got the information right. This is all from my own knowledge, none was copied and pasted! I love this post!! I have a couple of lenses, my favourite being my portrait lens! Thanks for this information, I'm saving money for a good cam and this post I'm definitely gonna use when it comes to buying the additional lenses! This was really helpful for me to read as I have a Canon camera but lenses have always been a bit of a mystery to me - really helpful and informative read! This post was AMAZING! Thank you so much for sharing this , I recently got a bridge camera for my birthday in September and it was really nice to now know and understand the world of lenes!! This post was literally so helpful - I've been blogging for about a year now and am trying to get more into learning about cameras and equipment!! Thank you for posting this!! The most significant thing you will need to comprehend about them is that they don't receive everything on the solarmovie eu.